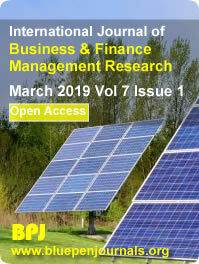 International Journal of Business and Finance Management Research (IJBFMR) is an open access academic refereed journal published monthly by BluePen Journals. IJBFMR publishes research articles that report premier fundamental discoveries and inventions, and the applications of those discoveries, unconfined by traditional discipline barriers. All articles published by IJBFMR are published in English. The objective of IJBFMR is to publish the most significant as well as innovative articles in the area of business as well as finance management researches; in other to accelerate the sharing and free-access of knowledge. Agency Theory, Brand Management, Business and Economics, Business and Economics Education, Business Communications, Business Ethics and Corporate Social Responsibility, Business Law, Business Level Strategies, Business Research, Capital Market Integration, CEO Compensation, Change, Commitment Compensation and Benefits, Competitive Dynamics, Conflict Management, Consumer Behaviour, Contingency Theory, Corporate Governance, Critical Management Studies, Decision Making, Decision Sciences, Derivatives and Structured Financial Products, Diversification Economics, Educational Administration/Management, Emotions at Workplace, Employee Relations, Entrepreneurship, Functional Level Strategies, Gender and Diversity in Organizations, General Business Research, General Management, Global Business, Health and Safety, HR and Technology, Human Capital, Human Resource Management, Industrial Relation, Institutional Theory, International Business, International HRM, International Management, International Marketing, Islamic Finance, Knowledge Management, Labour Relations, Leadership and Governance, Management Education and Development, Management Information Systems, Marketing Management, Marketing Theory and Applications, Mergers and Acquisitions, Venture Capital, Organizational Behaviour and Theory, Organizational Communication, Organizational Learning, Organizational Psychology, Ownership Structure, Performance Measurement, Personnel and Industrial Relations, Philosophy of Management, Portfolio Management, Production/Operations Management, Psychology (related to business), Public Administration, Relationship Marketing, Restructuring, Retailing, Pricing and Personal Selling, Risk Management and Internal Control, Services Marketing, Sexual Harassment, Small Business and Family Enterprise, Social Issues and Public Policy, Socialization and Orientation, Statistics and Econometrics, Strategic Alliances, Strategic Management Policy, Strategic Planning Systems, Supply Chain Management, Logistics and e-Business, Social Issues in Management, Social Issues in Marketing, Technology and Innovation, etc. All articles that are submitted to this journal are made to undergo sectioning to ensure that they are in line with the scope of IJBFMR and as well as the instructions for authors. Thereafter they are double-blindedly peer-reviewed by both internal and external reviewers. More than 100 reviewers are working diligently to shorten the review cycle of the academic research publication; and help researchers to pay more attention on the research itself, not waiting for too long, for suggestions from reviewers. The electronic version of published article is available at www.bluepenjournals.org/ijbfmr. The articles on this website are available in abstracts and full-text; and are accessible, free of charge to our web visitors. Copyright is a major issue for IJBFMR. Manuscript submission and their accessibility is not an infringement of copyright. All articles in IJBFMR remain the property of their authors. The contents of published articles represent solely the ideas of authors. Editors as well as Board of Editors of IJBFMR are not responsible for the views expressed by authors. However, the Editorial Board of IJBFMR takes responsibility for making publication decisions for submitted manuscripts based on the reviewer�s evaluation of the manuscript, policies of the journal Editorial Board and legal restrain acting against plagiarism, libel and copyright infringement.